Lift off with high-speed, high-flying action in this Ultimate 2-disc Edition that takes you inside the suit of Marvel's invincible Super Hero for the ultimate 'Iron Man' experience! After surviving an unexpected attack in enemy territory, jet-setting industrialist Tony Stark builds a high-tech suit of armor and vows to protect the world as 'Iron Man'. Straight from the pages of the legendary comic book, 'Iron Man' is a hero who is built - not born - to be unlike any other! I used to watch the old Iron Man cartoon all the time when I was a kid. It was always one of my favorites. So needless to say I was thrilled when I heard there was a big screen version coming out. I will admit I was concerned when I heard that Robert Downey, Jr. got the roll of Tony Stark/Iron Man.... since even though he is a decent enough actor... he never really impressed me all that much. But I must admit... I really liked him in this movie. He seemed to nail the role for me. I don't remember ever seeing the origin story of Iron Man... so I can't say how true to the comics/toons it is. But it is a movie I definitely enjoyed every second of. Sure there was some things that was really unbelievable in the storyline... like being able to create the suit he did in captivity... without the captors being any the wiser about it. But you know... I really didn't mind it. It worked for me. If there was anything in this movie that did NOT work for me it had to be the last thing Tony Stark said in the movie... at that last press conference. That to me just did not work. And should have never been added in there in my opinion. That one sentence lead to a bit of a disappointing feeling to finish the movie out with. But I am anxious on how they will continue the story. So I am hoping we see a sequel real soon! If there was anything in this movie that did NOT work for me it had to be the last thing Tony Stark said in the movie... at that last press conference. That to me just did not work. And should have never been added in there in my opinion. That one sentence lead to a bit of a disappointing feeling to finish the movie out with. But I am anxious on how they will continue the story. I have read, that in the comics, Tony Stark was a big part in a movement, which wanted to get the superheroes reveal their true identity. On that occasion, he made it publicly known, that he is Iron Man. Did you watch until after the end credits? There is an additional scene. No I didn't! thanks for letting me know! I will have to watch it.... NOW! :p Damn! I usually do that the first time I watch a movie too! DAMN!!!... OK... now I REALLY can't wait for the sequel!!!! And damn those credits was long... I felt like I was waiting forever with having it in FF mode X16 speed! Yeah that is what I got from it as well. I know it isn't a sequel per say... but it will feel like one to me. I just forgot who all was in The Avengers... so Thanks for that. And Cool... will be looking for him in The Incredible Hulk... That is up next anyway! I know it isn't a sequel per say... but it will feel like one to me. There is also a real sequel planned for 2010. OK... This one I was really looking forward to. Even though I tried not to I went into it with my hopes pretty high on it. After watching this movie I can say... Finally, an Incredible Hulk movie that is worthy of the title! It seems like everything the first Hulk movie did wrong this one did right. The story is ten times better... the special effects are much better... as are the actors. The fight between The Hulk and Abomination was great... lasted just long enough. Some of these movies tend to extend that final fight longer then it should be. I went into this movie thinking this would be my favorite movie of this marathon... but after only two movies I can not say that. As much as I loved this movie... and I did love it... I enjoyed Iron Man a little bit more. Like you I also think that this movie did it right. This is how the first movie should have been like and the Hulk movie franchise wouldn't have such a hard standing (I think). It went so smoothly with first Nick Fury talking about bringing the Avengers together at the end of Iron Man... and then the end of The Incredible Hulk we have Tony Stark in search of The Hulk to join the team. It made it almost feel like The Incredible Hulk was a continuation (in a way) of Iron Man. The first ever CGI Resident Evil full length feature film based on Capcom's multi-million dollar game/film franchise! A zombie attack brings chaos to Harvardville Airport. Leon Kennedy and Claire Redfield - former special forces members during the Raccoon City tragedy 7 years ago - battle a rogue warrior who is seeking revenge against WilPharma and the bio-weapons industry after his family was killed in Raccoon City. The deadly G-Virus is unleashed and a new mutated monster goes on the attack. OK... I thought it may be a good time for a bit of a change of pace. A move from Superheroes to Animated Horror. I bought this DVD purely out of curiosity. Not really knowing what to expect or if I would enjoy it. Even though I found it to be an interesting release... and have some great animation. I found the movie itself to be a bit on the slow side... but it did have some cool scenes. I am not sorry I got it... but at the same time it is not one I will watch too often. When Hancock grudgingly agrees to an extreme makeover from idealistic publicist Ray Embrey (Jason Bateman, Juno), his life and reputation rise from the ashes and all seems right again — until he meets a woman (2003 Academy Award® winner Charlize Theron, Best Actress, Monster) with similar powers to his and the key to his secret past. This one was another blind buy for me. But I always thought the trailer looked awesome. Unfortunately I wouldn't go that far to describe the movie. 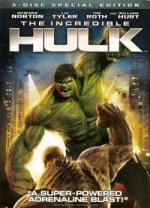 It is a good movie I was able to enjoy.... but it is no where near the caliber of Iron Man or The Incredible Hulk. Or really any of the other big time Superhero movies I enjoy watching (Spider-Man, Batman Begins, Fantastic Four, and so on). It is definitely a different type of Superhero movie... and I do give it credit for that. I just didn't find it to be as enjoyable. I just didn't find it to be as enjoyable. I almost thought as much, that this movie is not really for you. A lot of people were disappointed, as the trailer promised a different kind of movie. But I thought it was a great movie! yeah... that could be a big part of it now that I think about it. It really wasn't what I was expecting after watching the trailer. And like I said... it isn't a bad movie... I did enjoy it. So I am wondering if I may not enjoy it even more on the next viewing now that I know what to expect from it. Oh well... only time will tell.